Our standard products are a range of high quality solid wood products. Like our custom products they are normally made to order but they are made in a specific wood. They are readily available reducing delivery times and costs. What makes them standard products? 2) Our manufacturers regularly produce this product and therefore have the necessary set up in place, reducing cost and delivery times. 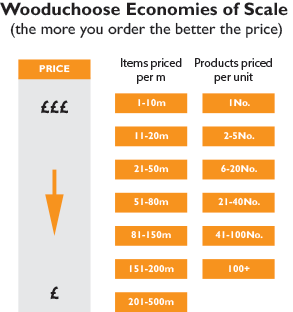 As these products are all made to order - the larger the quantity the better the unit price. Click here for the pricing scale.